Woah….dont freak out ! These aren’t morphed pics! Nor are they a miracle of God !!! They are man made ! 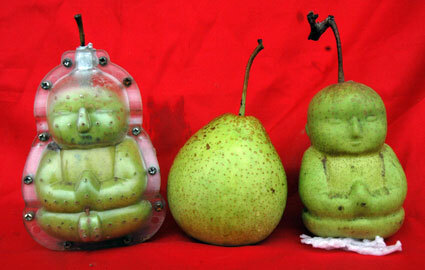 A Chinese farmer has invented baby-shaped pears. Actually they are in the shape of the Buddha but you know the western media….they prefer to call it baby shaped 😛 . Farmer Gao Xianzhang has created 10,000 of the mini marvels this season and he plans to take the fruits of his labour to the UK and Europe. ‘People seem to think they are cute or lucky and will buy them as soon as they’re off the tree,’ Gao explained. This fruit will be a big hit in India for sure ! Many Indians are very religous…& are easily convinced by things which reinforce their belief in a higher power. Remember the Divine Potato incident ?